Spring is finally here and I’m motivated to get things done both at work and at home. One thing I’ve learned about motivation – I need to roll with it when it hits me! It is so easy to succumb to motivation’s disruptive opposite – procrastination! Every day I have to break my addiction to that bad habit. Like so many other habits I’ve gathered over the course of my life some are great for me and some I would do well to let go. This time lets take a look at how we can determine which habits are worthwhile and which might be useful to chuck out with those old clothes! Once again I get the privilege to write to all of you. As promised in March’s article, this time we’re going to discuss the second phase of moving towards living in enthusiasm: identifying and releasing habits that don’t serve your overall higher purpose. I know you all have completed your objective assessment of an area in your life you would like to change. If not, do it now. You can download the worksheet here. If you are not in the mood, just read on! I must admit that I am inspired in my writing today by Elizabeth Gilbert and her unbelievably touching book Eat Pray Love. As always when in the presence of creativity I feel more creative. It is some sort of quantum-birds-of-a-feather effect I am sure, but I am much more interested in experiencing it than analyzing it. How many times in my life has my heart known the true answer or right action and my head has analyzed it into the ground, paralyzing me into inaction. Whether by my old friend insecurity or her cousin doubt, my heart’s instinct has at once seemed silly, impulsive, irresponsible or simply stupid. Please note that I am writing about my heart’s instinct not my first instinct. It is my experience that the instincts of my wizened heart have to bubble up. They do not always immediately leap to my conscious awareness. As I thought about this I realized that in my head I have not changed. I still envision myself living on vodka martinis and dancing in impossibly high heels, battling depression and erratic mood swings with copious supplies of recreational mood altering substances. In my heart I have become a different woman completely. I am most happy with coffee and a good book. I am most happy cooking for others. I am, in fact, quite happy and dare I say, content, on a regular basis. In truth my heart is wildly happy, fulfilled, engaged and downright jumping for joy even when my mind exhibits the old habits of melancholy and depression. I have found it very useful to cultivate a skeptical view when my mind puts up unhappy, frumpy and downright depressed pictures. They are often just signals that I need sleep, good food, uplifting company or affection. Somehow there is a part of me that thinks I do not deserve this happiness. My mind believes that to be content is to give up striving for something I am supposed to be striving for. That I have lost that “fire in the belly” that everyone used to talk about with such reverence. And then the voice of my heart pops up and says, “That is balderdash! The whole entire point of living is to be content.” My brain wants to qualify that with a long list of other stuff I am supposed to be doing. I will spare you the laundry list. What is important is that the habits I need to break are first in my mind and then acted out in my life. I must continue to master that scary and sometimes willfully out of control realm that I call my mind. My most powerful weapon for doing that is the oh so quiet and sometimes ignored Voice of My Heart. 1. Do you love your work? 2, Do you think you are supposed to love your work? 3. Would you do it for free? 4. What is your work for – helping people or making money? 5. Would you want your children or best friend to do exactly what you do every day? Now ask yourself, does your heart agree with the answers you selected above? Maybe you are already far along this path of living in enthusiasm and your first answers are the answers of your Heart Voice. If so I applaud you. Go forth and help others – really, I mean that. I’m not kidding. My feeling though is that in every person’s life there is an area where the first answer to simple questions like, “Are you happy doing ____ ” will be very different from what your Heart Voice would say. Does your relationship fulfill your emotional desires? Are you at peace with your parents? Can you trust those you love? If your Heart Voice answers, “No” to simple questions like these that gives us valuable information. More importantly it gives your Heart Voice a seat at the table of your life. No matter what you do or do not choose to enhance through this program, it is critical that this voice within have an outlet and a manner for communicating with you – the conscious, aware, get-up-in-the-morning-and-get-dressed version of you. Really – that’s it. Nothing fancy. Nothing complex. Just the simple process of pausing before acting, checking in with yourself and choosing differently. I know lots of great people have written long books on this subject but I really believe keeping it simple is the recipe for success. Let’s take an example with a fictional person. Jamie is not happy with her work. She tells her family that she is happy to be there and have a stable job. Every day she gets up, goes to work, does a good job and comes home. She thinks that she should be grateful for what she has instead of longing for something more exciting or fulfilling. She see’s her friends who have been laid off and feels guilty for wanting something different. She does not think she is particularly smart or talented. She believes she should keep her head down and be happy where she is. Maybe, she thinks, something will change later. 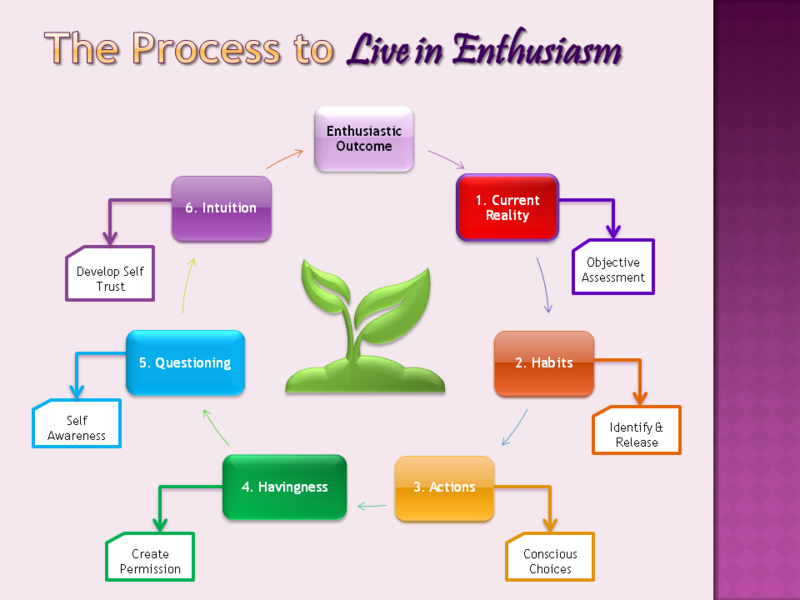 Now, let’s go through and identify the habits in her mind that are keeping her from living in enthusiasm. 1. Denial – Jamie’s Heart Voice is well aware she is not happy but her mind tells her to ignore it. 2. Guilt – Jamie has not given herself permission to feel happiness from her work. 3. Low Self Esteem – Jamie does not believe she has anything special to offer the world. 4. Victim Persona – Jamie does not believe she is empowered to make changes in her life. 5. Fantasy – Jamie is waiting for the equivalent of a knight on a white horse to rescue her from this situation. Each of these thoughts are habits of the mind. Jamie has acquired behavior patterns born from denial, guilt, low self-esteem, victimhood and living in fantasy to the point that they are involuntary reactions to her own life. And yet, I have never met a person, once confronted with these attitudes in simple words, who was content to remain that way. Many coaching, behavior modification and 12 step programs use a process called contrary action. In short you embark upon a behavior almost 180 degrees opposite to what you would normally do, say or think. For Jamie, the first step is to be honest with herself. She can change the pattern of her thinking by doing these simple steps. In Jamie’s case choosing differently (Step 4 in this exercise) means to tell herself the truth within her own mind – “My job does not make me happy.” As she begins to tell herself the truth she can apply this to further mental habits. Jamie can begin to tell herself a different story about her options in her career. She can begin to learn how to encourage herself and reveal her innate courage and sense of adventure. Before she can do things differently, she must think about things differently. By stopping to take the time to focus on the things she has told herself in the past and changing them she is actively engaged in Step 2 of the 7 Steps to Living in Enthusiasm. She is empowering herself and releasing her habits of victimhood and fantasy. She is giving herself permission to grow and think differently She is giving space to her Heart Voice. By this simple act she is releasing many existing habits. This is internal work, that happens quietly in your own mind first and is then translated out through your behavior and actions. This all takes time and practice, but really – what else are you doing? Serenity and a true sense of purpose awaits you. A loving relationship awaits you. A great body image is available for you right now. You name it and you can transform your experience by breaking these self defeating habits of the mind. Empower your Heart Voice, turn down the volume on the old mental habits and find a grounded balance between the two. Pick a subject, try it for 30 days and let me know what happens. Next Time – Step Three! I think you know what’s coming next. Actions! Conscious Choices! Woo hoo! This is your chance to translate these theories into reality. This is an amazing journey I’m on with all of you. Thank you for letting me into your life! Listen to your Heart Voice! Posted in Goal Setting, Life Strategies.